Classes are a fun way to strengthen concentration, heighten focus and memory skills, relieve stress and build stamina. Drumming is a catalyst for awakening your Spirit and creates opportunity for personal empowerment. 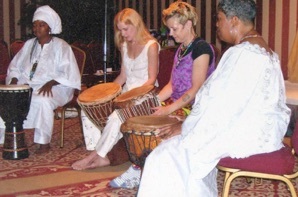 Drumming is an integral part of Western African tradition. All facets of life are communicated through dance, ceremony and ritual. I have been studying these rhythms for many years. I have studied with Master Drummers and Teachers in Conakry, Guinea. I have worked with Masters in the US who brought teachings from Mali and Ghana and with Baba Kenyatta Henry, who studies the traditions of Guinea. And I rely on the knowing that the rhythms and songs are planted deeply in my DNA. I respectfully teach beginning West African drumming. I am honored to share this aspect of drumming with many who may otherwise have no opportunity to experience it. African drumming class is for anyone who wants to learn about African music and culture. I provide drums, but you are encouraged to bring a drum if you have one. The very act of drumming is Spirit-filled. It is invigorating...energizing. The drum can be used to calm the spirit, by tapping into its grounding energies. It can also be used to heighten spiritual awareness and communion with whatever higher powers one relates to. The drum can be used to support a wholistic approach to nurturing the mind, body and soul. The drum has healing effects that occur naturally, as well as with a specific purpose and intention. I utilize the drum and other sound healing techniques to support individuals in improving their quality of life. “Working with Joan these past three years has brought me so much growth - mentally and spiritually.